This is really pretty! Love it. This recipe certainly doesn’t disappoint! Looks absolute delicious and French Toast does happen to be my favorite meal of all time. Even beats out pizza. Wow! French toast beats out pizza?! While I love my French toast, I think I might be a bigger fan of pizza. Thanks Patrick! Hope you had a great weekend! 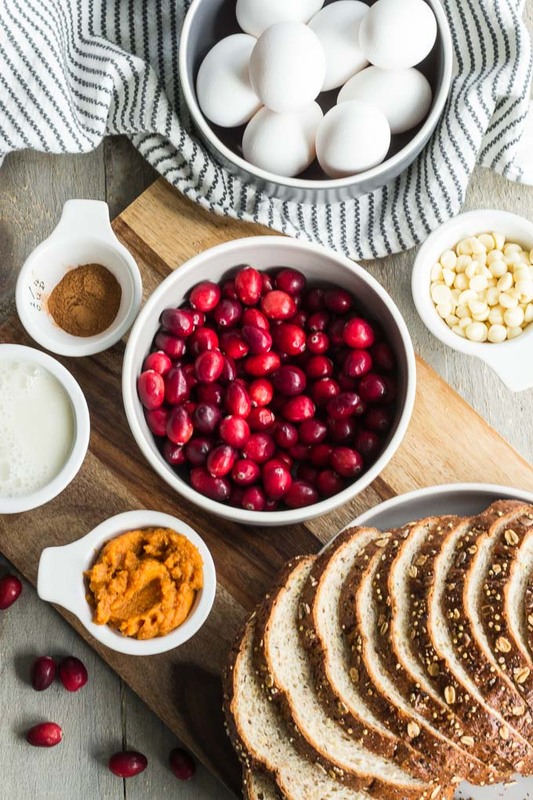 I’m a huge fan of fall and holiday recipes and this one is perfect! Can’t wait to try and make this myself! Thanks Terry! Hope you like it! Be sure to let me know what you think if you make it! Ths looks fantastic!! My hubby would be all over this! Thanks Lisa! My hubby probably wouldn’t eat this, which means more for me!! This looks like the perfect weekend breakfast or brunch. 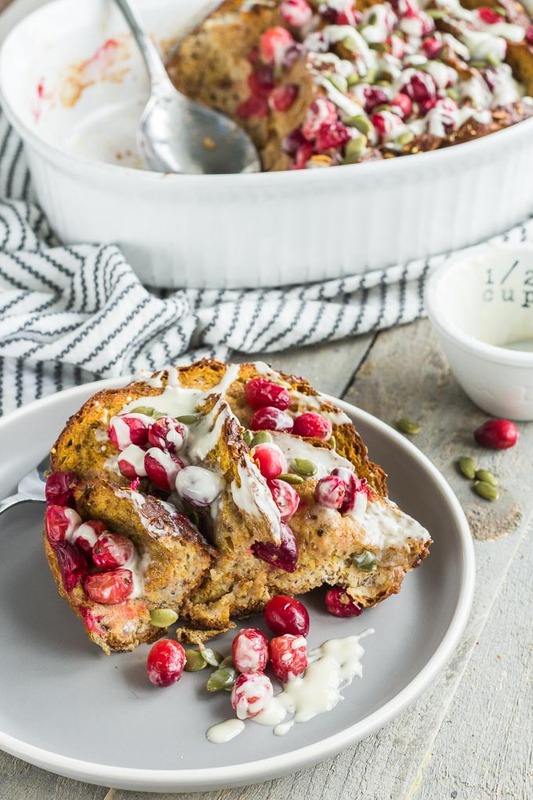 Cranberry and pumpkin must taste great in french toast. 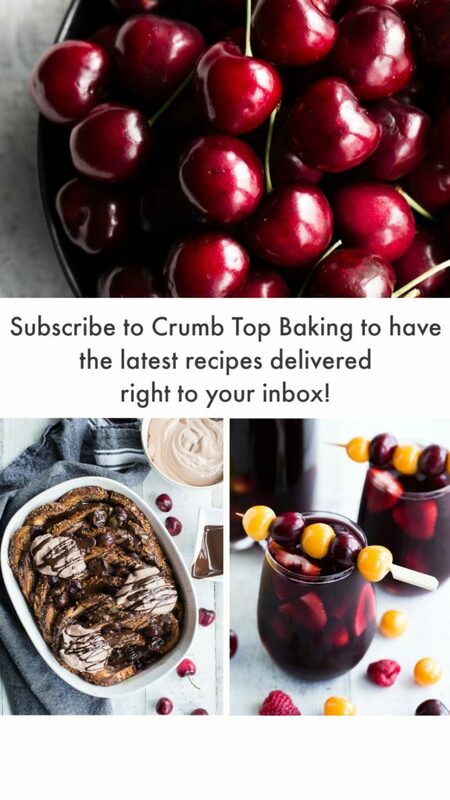 All I have though is dried cranberries, do you think that would be okay to use in this recipe? I would love to try out this recipe, thank you for sharing Leanne. Thanks Ashika! 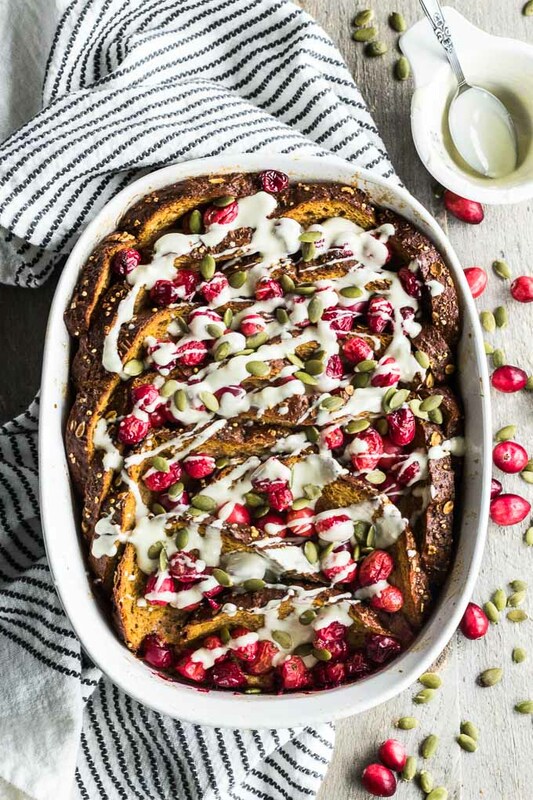 You could totally use dried cranberries, but I would add them to the French toast after it bakes, along with the pumpkin seeds. If you bake the dried cranberries with the French toast, they might burn. Let me know what you think if you make it! 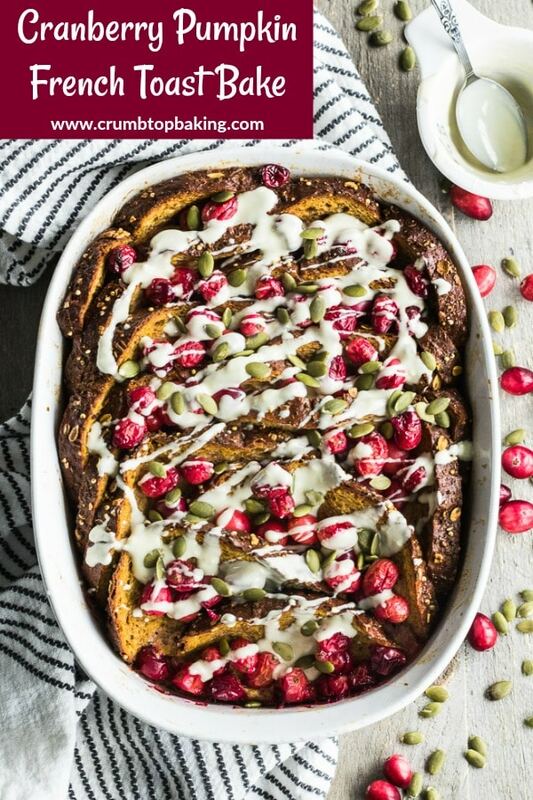 Pumpkin and cranberries belong together don’t they? I always do a big breakfast on Thanksgiving (you know–’cause there’s not enough food later on) and I think this would be perfect! You’ve outdone yourself, Leanne! Have a great weekend! Thanks so much Kelsie! Holidays and big breakfasts just go together! And I’m totally looking forward to all the baking, cooking and eating this holiday season! Hope you had a lovely weekend! There’s no way I’ m having this without the white chocolate! Love the combo here and it definitely does double duty as breakfast or dessert! So exciting for all the holiday eats, especially baking. This sounds incredibly yummy, Leanne 🙂 Hope you’re having an awesome weekend! Thanks Dawn! I’m with you. Definitely need all the white chocolate! I can’t wait for the holidays this season, and it’s mostly to do all the cooking and baking I have planned. Hope you had a great weekend! This is happening! My family will love it! What a beautiful addition to the holiday breakfast table! Pinned! Thanks so much Annie! I hope your family enjoys it! This looks and sounds delicious, Leanne! And I love the fresh cranberries and pepitas for those festive pops of color! Thanks Marissa! 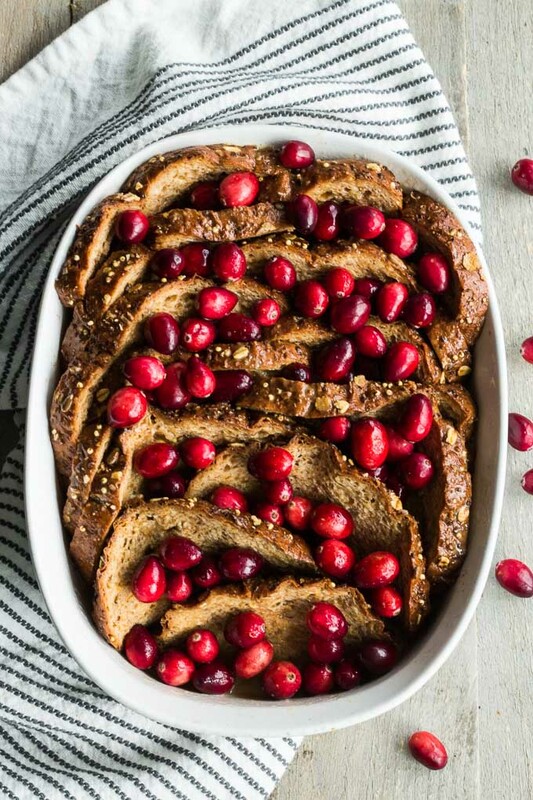 I love the pop of colour that cranberries add to holiday dishes! And the tart taste is great too! 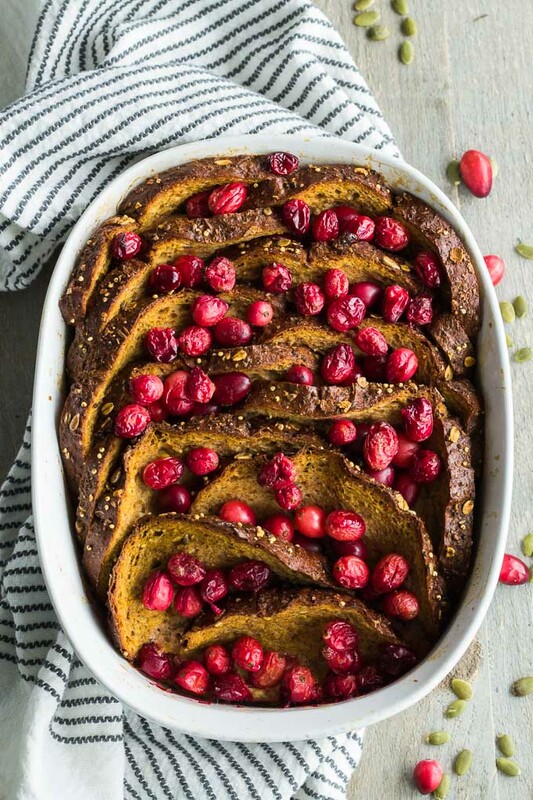 I love all the flavor of fall in this French toast! It looks so wonderfully delicious! My kids would be jumping out of bed in the morning if they could smell this in the oven! And that white chocolate drizzle – perfection! Thanks Kelly! It creates a lovely smell in the kitchen! Definitely one way to get people out of bed in the morning. And the chocolate drizzle might be my favourite part! I could never mind you posting delicious baked french toast! 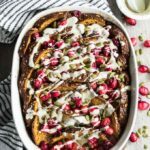 This has everything I love in it this time of year and it would be so perfect for holiday brunch! Thanks Marcie! I’m definitely planning to make this for Christmas brunch this year! Can’t get enough of cranberries this time of year! The chocolate is definitely not optional!! I love my breakfasts too, Leanne and this one is such a perfect one to serve for one of the upcoming holidays!! I certainly don’t mind you easing us into the holiday season with such a yummy looking brunch!! Thanks Katherine! The chocolate isn’t optional for me either. Glad you agree! Hope you’re having a great week! Can you believe I have never made a french toast bake!!! It’s true, but my wife has mentioned them quite a few times….I can’t wait to make this for her, I know she will just love it. Drizzling it with the white chocolate is just icing on the cake! Thanks Markus! French toast bakes are great to make for a crowd. You just assemble and bake. So much easier than making french toast on the stove top. And the white chocolate is a must (in my opinion) especially if you’re making it for a holiday brunch! Hope you get to try a french toast bake soon!